Have you ever pictured yourself far from home, helping others who primarily speak foreign languages, may be impoverished, seeking education, or recovering from a natural disaster? Have you ever thought of taking a service trip during the summer months away from the classroom to work with organizations that serve people in need? Annually, more and more organizations and individuals run service trips where new or returning volunteers can participate in a variety of interest-based trips. They offer convenient timeframes and affordable price ranges, and the hope of making others’ lives better in some way, shape or form. Often, people including healthcare professionals and educators are called to help serve children in need. Teachers often find the work rewarding, and they bring that experience back to their classrooms. Now might be the time to prepare for one of your own! I’ve participated in four service trips, and where else did I learn about them firsthand was in an academia setting. In September 2001, Fr. Ronald Stanley was new to our liberal arts college, but shared his story of bringing students on private service trips into the rural mountains of the Dominican Republic to distribute donations to families who had little access to modern-day amenities – something he had done for the past couple of decades. The mission trip was generally faith-based, but our student volunteers were from all beliefs and practices, from religious people to atheists, to those who were vegetarians, teachers, and healthcare workers, so we had to make a lot of activities “work” for the entire team. One of the highlights was working with children in the classrooms on lessons, crafts and games. We lived with some of the families for two weeks, fixing their houses and distributing donations. When Fr. Ronald Stanley passed away from cancer in 2011, shortly after returning from his final service trip, it was then at his eulogy that I learned how much money he raised for the region, quietly helping a community gain access to paved roads, electricity and outlets towards education in urban areas. Before his passing, Fr. Ronald Stanley told me about a youth group, which then lead me to Mustard Seed Communities, a religious-based organization that supports children living with AIDS and disabilities in Jamaica and other countries. They operate schools, medical facilities, farms, housing, a pottery shop, house a radio station – you name it. Again, it was a project that had been around for decades. I returned twice after my first trip there, seeing that more and more children were surviving on the life-saving “cocktails” of medicines for AIDS and that the organization had increased educational opportunities as more children were surviving into adulthood, while managing the disease. We again had a wide variety of volunteers, from religious churchgoers to agnostics, as well as educators that were my friends, and therapists from other parts of the United States. We all performed much of the physical labor like repairing building sites after a hurricane, repainting rooms, or playing with the children. There were several factors that these trips had in common. For one, I had done some research and heard several recommendations about the organizations before I decided to sign up for the trips, and I trusted the information. Second, price and timeframe were important, but these were flexible. Most of the money I either shelled out myself or we as a group found several ways to fundraise, by holding various money-making events like bar nights or calling corporations like Walmart and Target for gift card donations so we could bring supplies with us. We also had experienced leaders on both sides of the fence – from trip leaders in the states to leaders of the organization who were concerned about our accommodations, albeit modest (limited water supply, especially regarding drinking water in the Dominican Republic), and safety (we had drivers, guides and security and, for the most part, stayed with our group in enclosed areas, wherever we traveled in Jamaica). We had strict schedules, although we did have some downtime with relaxing car rides along the way, but our physical labor during the day in hot weather was demanding, since we would only be there for a short time and they had serious tasks we were expected to fulfill. Lastly, we grew close to the groups and the regions and felt like we were making a difference, taking much more away than we were giving. It was hard not to plan the next return trip or try to encourage others like teachers and students to participate on our next venture. 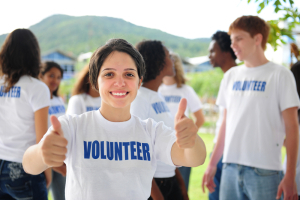 The debate on volunteerism – should you go? Some debate the practicality of “volunteerism” as noted in this NPR article, in which people travel on trips seemingly to exploit others’ situations for a short period of time without creating lasting impact. Some debate why more activities cannot be done on the home front, where millions of children struggle with poverty, abuse, life after natural disasters and mental health issues, or those who just need good mentors. For me, the trips mattered. I found tremendous value in going outside of the United States and seeing foreign soil for the first time. Secondly, I had and still have so many stories to share with friends and family about my experiences, and continue to learn about others and the opportunities they share about their overseas experiences. Lastly, the trips keep me pushing towards improving things on the home front, and identifying and getting involved in organizations here, especially ones that help children. Of course there are more opportunities out there, like the Peace Corps or shorter stay opportunities like teaching others English. I even read a book by Jim Ziolkowski, the founder of buildOn. BuildOn, is an organization that builds schools on various continents where education prospects are very low. BuildOn also allows volunteer opportunities for inner city youth, giving them the opportunity to serve and to see places they may have never have dreamed of. The Fulbright Distinguished Awards in Teaching (DA) Program, offers longer stay programs ranging from three to six months in international areas. Some deadlines are coming up for next year, so check their site soon at fulbrightteacherexchange.org. Teach at a sports camp, or maybe get away from education all together, by getting hands-on and building structures, cleaning up beaches, or participate in farming. Check out some of these ideas from the Huffington Post, for those who are in a time crunch for summer volunteer plans. Feeling brave? Attend an internship experience like this New Jersey teacher did, with White Shark Africa. Her amazing shark photo, from the waters of South Africa, lead to internet stardom when the image went viral online. The opportunity not only brought her personal fame. It made her students more curious in the classroom about sharks and it allowed her to bring more public attention to environmental conservation. Check out more opportunities and deadlines with Global Volunteers at: globalvolunteers.org. Need some more reading material to get ready for your service trip? Check out Volunteer Vacations: Short-Term Adventures That Will Benefit You and Others, by Bill McMillon, Doug Cutchins, and Anne Geissinger. There are many opportunities to help children within the volunteer realm, both in the U.S. and abroad. Have you ever been or do you plan to take a trip like these mentioned above? Tell TeacherCents your thoughts and opinions by sharing them in the comments section below. You understand thus considerably when it comes to this matter, made me in my opinion believe it from so many various angles.